Moisture-proof poly wrap keeps your paper protected 16-lb filler paper fits binders of all sizes. 3-hole punched to fit most standard binders. 2 Pk. 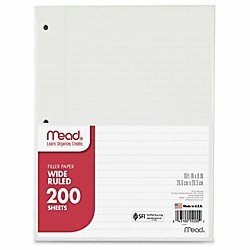 Mead filler paper, loose-leaf paper. 150 sheets per pack.